Frozen princesses were enjoying the snow as usual, but suddenly Ana suffered a fall and could not move his arm, had to take her to the emergency room. You need your help to make an X-ray to check for broken bones, once observed if there was fracture surgery should take and be your doctor. First you will have to clean and sterilize hand to make the incision with a scalpel, opened with a special clamp and move the muscles to the bone, get there one by one the bone fragments. You will place the metal prosthesis and various screws fasten it'll fit one to one with the electric screwdriver. Finally, you will suturing needle and thread the open arm area princess. To recover, Ana wants to leave the radiant clinic and return to his adventurous life. 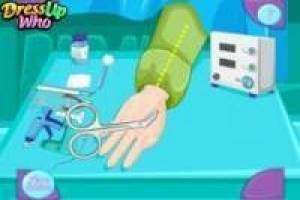 Enjoy the game Princess Anne and her arm operation, it's free, it's one of our frozen games we've selected.